Classic Mac OS is the series of operating systems developed for the Macintosh family of personal computers by Apple Inc. from 1984 to 2001, starting with System 1 and ending with Mac OS 9. The Macintosh operating system is credited with having popularized the graphical user interface concept. It was included with every Macintosh that was sold during the era in which it was developed, and many updates to the system software were done in conjunction with the introduction of new Macintosh systems. Apple released the original Macintosh on January 24, 1984. The first version of the system software, which had no official name, was partially based on the Lisa OS, which Apple previously released for the Lisa computer in 1983. As part of an agreement allowing Xerox to buy shares in Apple at a favorable price, it also used concepts from the Xerox PARC Alto computer, which former Apple CEO Steve Jobs and other Macintosh team members had previewed. This operating system consisted of the Macintosh Toolbox ROM and the "System Folder", a set of files that were loaded from disk. The name Macintosh System Software came into use in 1987 with System 5. Apple rebranded the system as Mac OS in 1996, starting officially with version 7.6, due in part to its Macintosh clone program. That program ended after the release of Mac OS 8 in 1997. The last major release of the system was Mac OS 9 in 1999. Initial versions of the System Software run one application at a time. With the introduction of System 5, a cooperative multitasking extension called MultiFinder was added, which was later integrated into System 7 as part of the operating system along with support for virtual memory. By the mid-1990s, however, contemporary operating systems such as Windows NT, OS/2, and NeXTSTEP had all brought pre-emptive multitasking, protected memory, access controls, and multi-user capabilities to desktop computers, The Macintosh's limited memory management and susceptibility to conflicts among extensions that provide additional functionality such as networking or support for a particular device, led to significant criticism of the operating system, and was a factor in Apple's declining market share at the time. After two aborted attempts at creating a successor to the Macintosh System Software called Taligent and Copland, and a four-year development effort spearheaded by Steve Jobs' return to Apple in 1997, Apple replaced Mac OS with a new operating system in 2001 named Mac OS X. It retained most of the user interface design elements of the classic Mac OS, and there was some overlap of application frameworks for compatibility, but the two operating systems otherwise have completely different origins and architectures. The final updates to Mac OS 9 released in 2001 provided interoperability with Mac OS X. The name "Classic" that now signifies the historical Mac OS as a whole is a reference to the Classic Environment, a compatibility layer that helped ease the transition to Mac OS X, now titled macOS. Apple's concept for the Macintosh deliberately sought to minimize the user's awareness of the operating system. Many basic tasks that required more operating system knowledge on other systems could be accomplished by mouse gestures and graphic controls on a Macintosh. This would differentiate it from its contemporaries such as MS-DOS, which use a command-line interface consisting of terse, abbreviated textual commands. Apple aggressively advertised their new machine. After its release, the company bought all 39 pages of advertisement space in the 1984 November/December edition of Newsweek magazine. The Macintosh quickly outsold its more sophisticated but much more expensive predecessor, the Lisa. Apple quickly developed a product named MacWorks, which allowed the Lisa to emulate Macintosh system software through System 3, by which time it had been discontinued as the rebranded Macintosh XL. Many of Lisa's operating system advances would not appear in the Macintosh operating system until System 7 or later. Towards the end of 1987, Apple introduced a package titled "Apple Macintosh System Software Update 5.0". For the first time, the Macintosh operating system was offered as a distinct retail product that included four 800K disks and three manuals, at a cost of $49 USD. The software itself was still freely available through user groups and bulletin board services. While the product box presented this update to the operating system as "version 5.0", this number does not appear in the software itself. Three of the four disks (System Tools 1, System Tools 2 and Utilities 1) are all bootable, and the user can boot off of whichever floppy contain the tools the user needs. For instance, System Tools 2 is the only disk with printer drivers, and Utilities 1 is the only disk with Disk First Aid and Apple HD SC Setup. Because the disks are named System Tools, users and the press commonly referred to this version as "System Tools 5.0". The primary new feature of System 5 is MultiFinder, an extension which lets the system run several programs at once. The system uses a cooperative multitasking model, meaning that time is given to the background applications only when the foreground application yields control. A change in system functions that applications were already calling to handle events make many existing applications share time automatically, as well as being allowed to perform tasks in the background. Users can also choose not to use MultiFinder, thereby using a single application at a time. In 1990 InfoWorld tested four multitasking options for PC and Mac, viewing MultiFinder positively overall, but noting that its presence halved the speed of file transfer and printing compared to the single-tasking System 6 without MultiFinder. System Software 6 (also referred to as "System 6") is a consolidation release of the Macintosh system software, producing a complete, stable, and long-lasting operating system. Two major hardware introductions requiring additional support under System 6 are the 68030 processor and 1.44 MB SuperDrive debuting with the Macintosh IIx and Macintosh SE/30. Later updates include support for the first specialized laptop features with the introduction of the Macintosh Portable. From System 6 forward, the Finder has a unified version number closely matching that of the System, alleviating much of the confusion caused by the often considerable differences between earlier Systems. One of the most significant features of System 7 is virtual memory support, an essential subsystem anticipated for years, which only exists for previous Systems in a third party extension named Virtual from Connectix. Accompanying this was a move to 32-bit memory addressing, necessary for the ever-increasing amounts of RAM available to the Motorola 68030 CPU, and 68020 CPUs with a 68551 PMMU. This process involves making all of the routines in OS code use the full 32-bits of a pointer as an address—prior systems used the upper 8 bits as flags. This change is known as being "32-bit clean". While System 7 itself is 32-bit clean, many existing machines and thousands of applications were not, so it was some time before the process was completed. To ease the transition, the "Memory" control panel contains a switch to disable this feature, allowing for compatibility with older applications. ^ a b c d e f g h Linzmayer, Owen W. (2004). Apple Confidential 2.0. No Starch Press. ^ a b "The Macintosh Product Introduction Plan". Stanford University Libraries & Academic Information Resources. Archived from the original on July 21, 2010. ^ "Mac OS 9.2.2 Document and Software". Apple Inc. December 5, 2001. Archived from the original on April 21, 2006. Retrieved September 25, 2016. ^ a b c d e f g h i j k l m n o p q r s t u v w "Macintosh: System Software Version History". Apple Inc. August 7, 2001. Retrieved September 25, 2016. ^ Gruman, Galen (November 1997). "Why Apple Pulled the Plug". Macworld. 14 (11). pp. 31–36. ^ a b "October 23, 1999: Mac OS 9 Released". AppleMatters.com. Retrieved November 28, 2009. 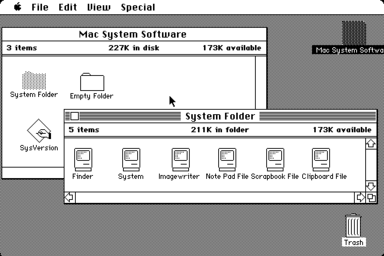 ^ "A Brief History of the Classic Mac OS – Low End Mac". 2012-07-26. ^ Mike Tuck (2001-08-12). "The Real History of the GUI". ^ Bruce Horn. "On Xerox, Apple and Progress". ^ "Folklore.org: We're Not Hackers!". www.folklore.org. Retrieved September 26, 2016. ^ "System 7.5 and Mac OS 7.6: The Beginning and End of an Era". 2014-06-27. Mac OS 7.6 deserves some special mention. The most obvious difference is the name change; this was for the Mac clone manufacturers, who weren’t making Macintoshes but “Mac OS Computers”. ^ "New Mac OS Extended Format (HFS+) Available". Apple Developer News. 1997. Archived from the original on May 12, 2008. Retrieved March 28, 2007. ^ "MacTech". Retrieved 21 September 2015. ^ Josh Burker (2002). "Multi-Mac". ^ a b c d e Kottwitz, Randal L. (1987). "The Power User's Manual". New York: MacUser Publications, Inc.: 11. Retrieved May 2, 2008. ^ "Mac GUI". Retrieved 21 September 2015. ^ a b c "Hard Disk 20: Boot From HD20 Locks Up HD20 and Macintosh". Apple Inc. November 10, 1988. Retrieved May 2, 2008. ^ a b c Denny, Bob (November 1985). "Programming for HFS Compatibility". MacTech Magazine. Westlake Village, CA. 2 (1): 8. Retrieved May 2, 2008. ^ a b "Mac GUI". Retrieved 21 September 2015. ^ a b c d e f g h "System Software: Configs for Mac 128K, XL, 512, & 512KE (7/94)". Apple Inc. August 3, 1994. Retrieved May 2, 2008. ^ a b Wiggins, Robert (March 1998). "All Systems Go - System Update 5.0". MacUser. Martin Mazner. pp. 126–138. ^ "Orchestrating applications". InfoWorld. September 24, 1990. p. 83. ^ "The Early Mac OS". Applemuseum.bott.org. Retrieved July 29, 2014. ^ "Apple Macintosh before System 7". Retrieved 21 September 2015. ^ "System 6.0.7 Fixed Two System 6.0.6 Problems". Support.apple.com. February 18, 2012. Retrieved July 29, 2014. ^ Ean Houts (1994-09-05). "QuickDraw GX is the big draw for System 7.5". InfoWorld. Apple has added a few features to spruce up the interface in System 7.5, although these have previously been available as utilities or shareware for quite some time. ^ Beale, Steven (October 1997). "Mac OS 8 Ships with No License Deal". Macworld 14 (10): pp. 34–36. ^ Jeff Walsh (1997-07-28). "Latest Mac OS pleases end-users". Infoworld. ^ "Where do you want to pirate today?". Forbes. August 8, 1997. the latest word out in the Macwarez scene is that pirates shouldn't copy Apple's OS8—Mac's latest operating system—they should buy it, since Apple so desperately needs the money. ^ "Mac OS 9.2.2 Document and Software". Apple Inc. December 5, 2001. Archived from the original on April 21, 2006. Retrieved February 23, 2017. ^ "What is an operating system (OS)?". Apple, Inc. July 15, 2004. Archived from the original on July 22, 2010. Retrieved September 6, 2014. ^ "Mac OS X and Unix – Apple" (PDF). Archived from the original (PDF) on May 30, 2009. Retrieved February 5, 2016. ^ Apple Computer (December 20, 1996). "Apple Computer, Inc. Agrees to Acquire NeXT Software Inc". Archived from the original on January 16, 1999. Retrieved February 23, 2017. ^ "Mac OS X: What is BSD?". ^ "OS X 10.1". 2001-10-15. ^ "Jobs: OS 9 is Dead, Long Live OS X – Macworld". May 2002. ^ "Executor source code". 2018-12-08.